Our precious Baby D is 4 months old today (okay, technically not until 10:25 PM!) Happy four months birthday, sweet baby!!!! And to celebrate, he took an hour and forty minute nap! YIPEEEE!!!! Of course it was probably because he was exhausted from spending the day yesterday with family and attending his auntie & uncle's baby shower! 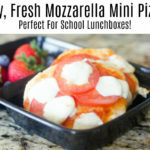 Easy, Fresh Mozzarella Mini Pizzas – Perfect For School Lunchboxes!